Last week, Chinese President Xi Jinping visited Mexico, as part of his first trip to the Americas. Earlier this year, during a trip to China to participate in the Boao Forum for Asia, President Peña Nieto extended an invitation to the Chinese President to visit Mexico. China and Mexico established diplomatic relations in 1972, but bilateral contacts are much older than that. In the XVIth Century, during the Spanish colony ships sailed the Pacific loaded with precious metals, cacao grains, avocados, tomatoes and other articles from the Americas that were exchanged for Asian spices, Chinese tea, porcelain and fabrics, especially silk. For most of the last 40 years, the relations between the countries were quite cordial, during the last ten years. However, diplomatic mishaps and a policy that sought to bring Mexico closer to the US, during the Fox and Calderon administrations, provoked the Mexican neglect of strategic partners in other parts of the world, and in particular in Asia. Despite regular high-level encounters in international fora, such as APEC or G20, and the signing of cooperation agreements in numerous sectors, trade rivalry overshadowed Sino-Mexican bilateral relations. Unlike the rest of Latin-America, the economic relationship with Mexico has not been based on Chinese investment to ensure the flow of raw materials to fuel China’s industry. In fact, cheap Chinese labour made Mexico and China direct competitors in the US market; in some cases, Chinese manufactures displaced national production in the Mexican domestic market. Furthermore, the bilateral trade deficit is heavily favorable to China; in 2012 Chinese exports to Mexico accounted for USD$57 billion, while Mexican exports to China were USD$5.7 billion (according to the Mexican Ministry of Trade, www.economia.gob.mx). The occasion to relaunch the bilateral relationship could not be better. Each President has recently taken office and both countries seek to reaffirm their positions as global actors. On the domestic side, President Peña Nieto’s administration started a series of structural reforms to increase economic productivity, while China seeks to maintain its economic momentum. The increase of Chinese wages and international oil prices has narrowed down the productivity gap between Chinese and Mexican products. China’s products are not as cheap as they used to, in some cases, it is cheaper and certainly quicker to import from Mexico than from China for US companies. These elements helped Mexico to leave aside fears and realise the economic potential of complementing, rather than competing with, Chinese partners. With the aims to enhance mutual trust, expand cooperation and deepen friendship, Peña Nieto and Xi Jinping announced the Comprehensive Strategic Partnership. This agreement aims to push for comprehensive, in-depth and mutual cooperation between the two countries and to make positive contributions to world peace, stability and prosperity. A permanent bilateral commission and working groups will follow the commitments established in the Partnership by the leaders. Likewise, the two Presidents agreed to move forward, solving the long standing conflicts on pork, tequila and textiles trade. They committed to increase trade and investment and established a high-level business forum. Mexico and China also signed memoranda of understanding to improve cooperation in energy, biotechnology, mining, financial services and sport. Additionally, President Peña Nieto and President Xi Jinping will encourage deeper people-to-people links. To start, the Chinese government will increase the number of scholarships offered to Mexican students from 40 to 300 per year. To increase cultural and academic exchanges, a Mexican cultural centre in Beijing and a centre specialising on Chinese studies in the National Autonomous University of Mexico (UNAM) will be opened. Finally, as symbol of the two countries’ endeavours to boost tourism flows, during the last day of the visit, President Xi Jinping and his wife visited the archaeological site of Chichen-Itza. Some specialists point out that the Chinese visit to Latin America is a sign to the US. China is pointing out that it has interests in other parts of the world, and is not afraid to contest US hegemony, even in the its back yard. Similarly, the US could interpret the visit as a payback for the recent increase in US engagement in Asia, China’s back yard. In any case, this is a perfect environment for Mexico’s diversification, since it could help to break the Mexican trade dependency on the US and to reaffirm itself as a key global player. As said by President Xi Jiping in his address to the Mexican Senate*, China has a population of 1,300 million, is the second largest importer, expects to invest overseas more than USD$500, and more than 400 million of Chinese tourists will travel around the world in the next few years. This is an incredible opportunity for countries in Latin America, and of course for Mexico. 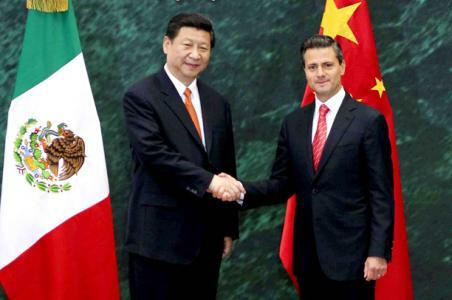 The Comprehensive Strategic Partnership has opened the path for a promising future for Sino-Mexican relations. * I do encourage you to read President Xi Jinping’s speech to the Mexican Senate.